When you select text, you can show or hide the handy Mini toolbar, which helps you work with fonts, alignment, text color, indenting, and bullets. Note: You can't customize the Mini toolbar. The following illustration shows the Mini toolbar when you rest your pointer on it. To use the Mini toolbar, select the text you want to format and then click an option on the toolbar. If you don't want to see the Mini toolbar, you can turn it off as explained next. In your Office application, click File > Options > General. Clear the Show Mini Toolbar on selection check box. Click the Microsoft Office Button , and then click (Office application name) Options. 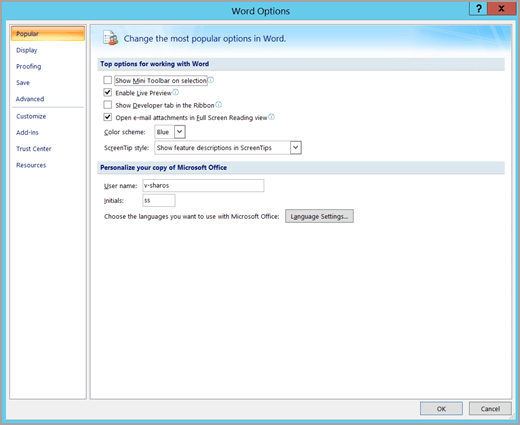 For example, click Word Options. Click Popular, and then under Top options for working with (Office application name), clear the Show Mini Toolbar on selection check box. Click the Microsoft Office Button , and then click Editor Options. 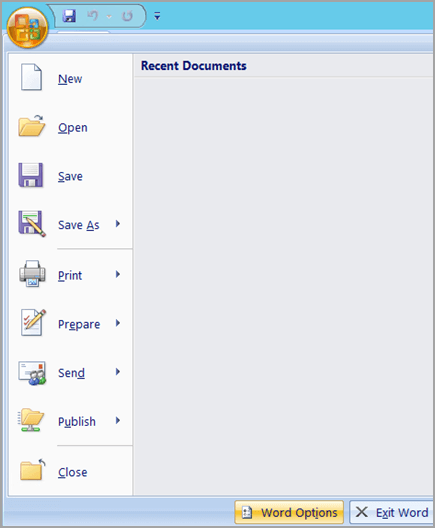 Under Working with Outlook and other Microsoft Office programs, clear the Show Mini Toolbar on selection check box.